Earlier this week Scribd released a new infographic, "Reading Around the World," based on some of their most recent international reader data. Their findings include details like Germans zipping through books faster than any other country in the world, and that Canadians are the most likely to read a book all the way till the end. 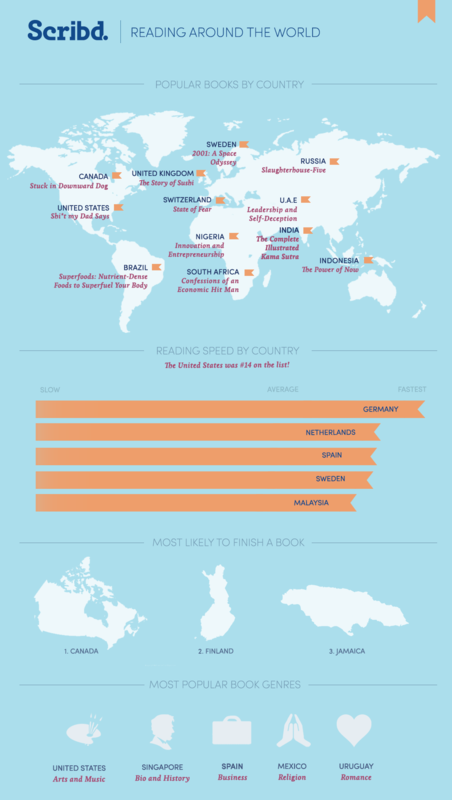 The infographic also shows that some countries' favorite books not what you would expect. Some countries' interests align perfectly with their national identities - others are a bit surprising! What’s most exciting about this is the reach Scribd appears to have, which would seem far broader than any other mainstream ebook provider. In the many parts of the world where Amazon surcharges the Scribd fee becomes very appealing, and of course Scribd also reaches the many parts of the world where Amazon blocks downloads altogether. Google Play seems the only serious international player right now among the western retailers, but their savage territorial restrictions in places they have yet to launch leave them at a serious disadvantage. If Scribd can get its act together with payment options for the many parts of the world where cards are not widely used Scribd could be the first truly global ebook store. For indie authors, now able to load to Scribd through both Smashwords and Bookbaby, the Indie Old Guard ‘s rhetoric that indies can sell ebooks anywhere in the world is a little less hollow. But indies still have a long way to before they can hope to match the reach of the mainstream ebook publishers. Until that happens the likelihood of any big-name author jumping ship and going indie is remote. Sadly we’ve lost a lot of faith in Kobo over the past year. The “localized” stores are by all accounts unknown locally, and the Kobo stores we can access are a mess. We hear worrying stories about missing titles and about meaningless rankings. One author showed us chart rankings where they held the same position in the same category for five different titles, three of which weren’t in that category. These are not isolated incidents. We just heard today that Kobo are saying Smashwords titles are being delayed from getting into the Kobo store because Kobo are still coping with the influx of customers from Sony NA. The partner stores are Kobo’s strong-point, but even Chapters Indigo seems to be losing its shine, and elsewhere there are few reasons to be cheerful. While the Kobo-National Book Store deal in the Philippines is a wonderful achievement and will no doubt reap rich rewards as the Philippines market evolves, that seems to be as far as Kobo have got with serious international expansion. Kobo’s India launch was a major disappointment – W H Smith India and Crossword?! – and appears to have set the tone for things to come. Of Kobo’s four Australian partners only Bookworld and Angus & Robertson carry titles with any reliability, and we use that term in the loosest sense of the word. Finding parts 2 and 4 of a five part series but not 1, 3 and 5 is typical. Collins doesn’t seem to know where it’s going with content and Pages & Pages is great for amusement value (the Kindle amnesty) but a micro-store for Kobo. In New Zealand it’s just PaperPlus since Whitcoulls called it a day, but there’s no sign on the PaperPlus website that they even sell ebooks. You have to hunt for them. Livraria Cultura in Brazil and the West European partner stores offer a glimmer of hope, but that’s all residual from Kobo’s glory days. Kobo do well in France thanks to Fnac’s brand, but what hope the Dutch and German localized stores? Obviously there are content rights issues with mainstream titles for these localized stores, but why is Kobo not at least getting all its world-rights indie titles into them? There’s talk of expansion into Russia and South Korea and elsewhere in SE ASia but clearly Kobo haven’t got the money behind them from Rakuten to do this is anything other than a small-scale way. That said, there is huge potential there. If Rakuten was to get Kobo ebook stores tagged onto their many online retail outlets they would have the reach in SE Asia to make serious headway. Maybe the new guy in charge of Kobo understands Kobo needs Rakuten’s resources. Without them there’s little hope Kobo can do other than tread water. And then there is Whitcoulls, which is still down a month and a half later. Most popular genre in the US is arts and music? I can hardly find the U.K. and nowhere can I see France. Are these two countries trailing? Why no data from AUSTRALIA? Missing a whole continent!